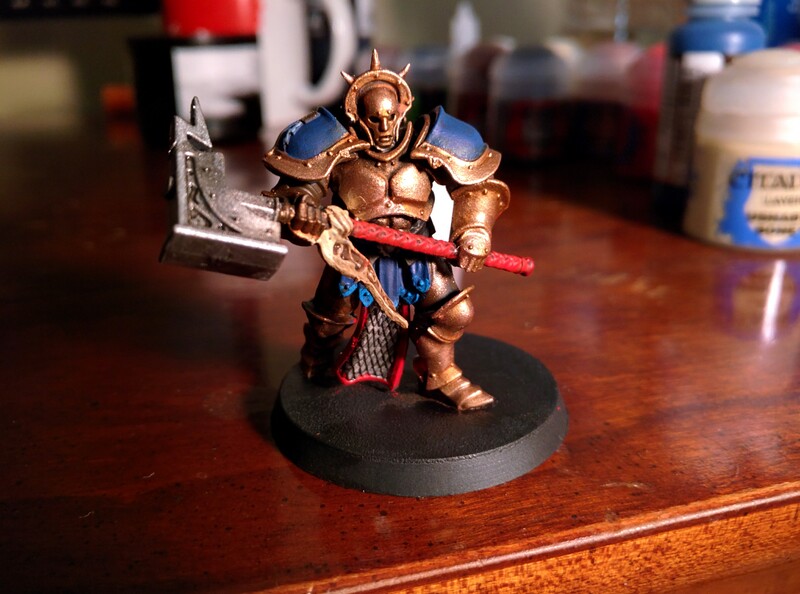 Wanted to share some images of the Stormcast I painted back when Age of Sigmar was fairly recent. Critiques and advice are welcome, though there are some obvious mistakes I realized I made since then . 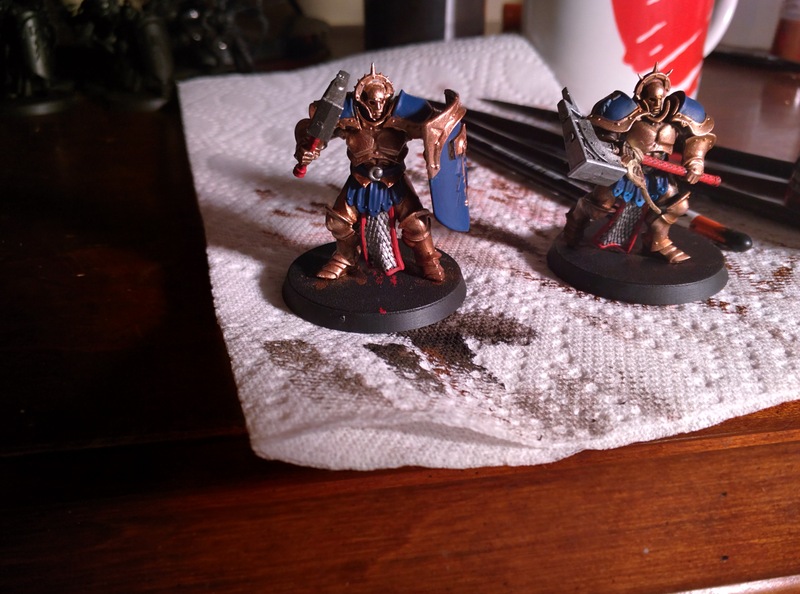 Should have gave the armor multiple coats, as the one I gave the models was a little grainy. I applied washes, but maybe should have put down a second coat. Should have drybrushed the haft of the Grand Hammer and used black instead of silver to paint the joints. Also, smaller brushes for the symbols on the shoulder pads is probably the greatest lesson learned. Man, those were a real pain to paint with the brushes I had . Also, this is like my third attempt at painting in general, so there's that . They look great, especially as they are the third unit you've painted. If you want to try and push the painting to the next level, I cannot recommend the GW youtube painting videos enough, and they should have one on how to do that chamber of Storm Casts to a Duncan Rhodes, Standard. Only advice I could give, is to get your bases finished! Aw, thanks Killersquid ! I'm not really working on the stormcast anymore, as aelves are officially here in the Age of Sigmar universe. I only painted those five stormcasts, but I do have some more figures from the starter set if I ever change my mind I guess. I definitely seek to rectify the base situation next time around , already started a thread for future ideas. Also I subscribed to Warhammer TV about a year ago ^^! You're right, the amount of tips and techniques you can learn from that channel is too much to pass up! I like what you have achieved here MyenTal. Any paint finish that looks clean and smooth is a winner from my point of view. I also really like the way you have painted the belt and tabard. Thanks for the comments, Alienscar , glad to know you like them! 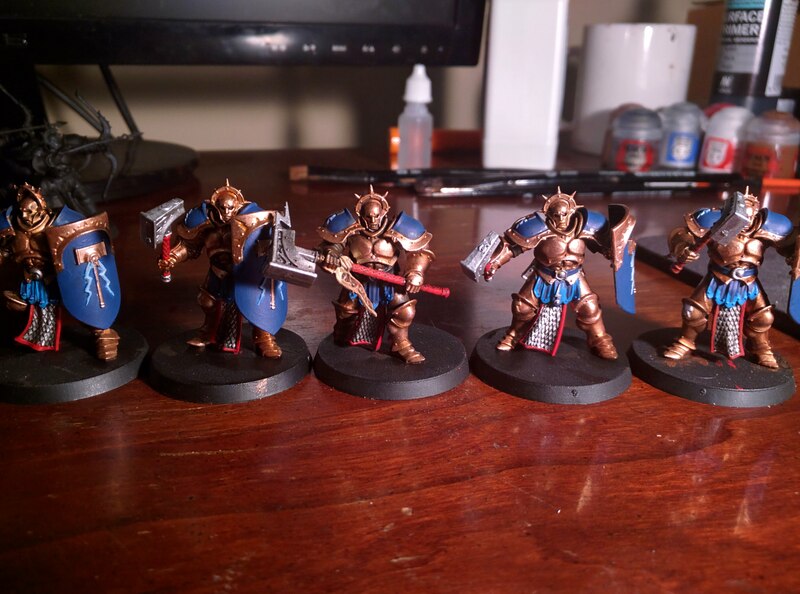 The tabard makes the models stand out I think, makes me wish I used a more lustrous shade of gold to match the shine. Lessons to apply for the next time . Those Stormcasts are really nice MyenTal. I like the colour choices that you've made and the paint work is neat and smooth. Got to agree with Alienscar too, the tabard and belt is nicely done and adds a nice zing to the models. If you were to put together a nice base and then maybe highlight the golden parts a little (Liberator Gold is an excellent and forgiving colour), these models would really pop. Great stuff, now show us some recent work (In the Projects )! Lol, thank you, Looshkin! Yeah, I agree with you, some more highlighting on the gold would be really nice! Glad you guys like the tabard and belt, also my favorite parts . Who knows, maybe I'll try my hand at the starter set I have. But that's a little ways off, still need a new and comfortable chair to do all of this work in, and a more adequate desk space I think. My computer and PS4 hog all of what I have right now lol .